What do Oprah Winfrey, Sandra Day O'Connor, Margaret Thatcher, Marie Curie and Sojourner Truth have in common? Not only are they some of the world's most influential women, their life lessons are now revealed in the latest book by Pat Williams. Williams blends the personal accounts of each influential woman with the contemporary and historical insights of others, what emerges is an intimate portrait of each great person-her motivations, her aspirations, her personal challenges and the qualities that made her so successful at her calling. An added bonus is life lessons at the end of each chapter, which provide remarkable motivation for women who are blazing a new career trail, building a strong family or struggling to "have it all". This exceptional book highlights a diverse group of women, from activists, businesswomen and humanitarians to athletes, explorers and scientists-it will appeal to any reader regardless of age, occupation or creative pursuits. 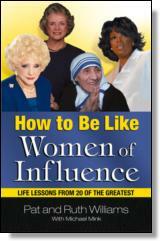 Profiles of women of influence include: Eleanor Roosevelt, Rosa Parks, Mary Kay Ash, Helen Keller, Anne Frank, Amelia Earhart and others. This is not a history book-it is a perfect blueprint for creating a successful life. When my husband told me he and his collaborator, Michael Mink, were going to write a book about women of influence, I was elated. Then when Pat invited me to share my insights by participating in writing the book, I got even more excited. Pat has written over thirty books, all motivational and inspirational, about leadership, teamwork, sports legends, biblical heroes and world figures. These books have included stories about strong women, but he has never devoted a book entirely to women—until now. And it's about time. In his 1998 book, The 100: A Ranking of the Most Influential Persons in History, by Michael H. Hart, not a single woman made the list. Why? Because the roles of women during the first one hundred years of our country were very limited. They were either mothering or teaching. There were no real alternatives unless one was a ballerina or opera singer or an actress. However, because of the Industrial Revolution, two world wars, the Civil Rights Act and the women's movement of the 1960s, women gradually moved into the spotlight and began blazing their own trails. Enrollment of women in law school and medical school has jumped substantially as well as in architecture and engineering. There are more and more women with MBAs who are scaling the heights of the corporate ladder successfully. The choices women have today are unlimited. The unique women you will meet in this book were the catalysts who made it possible. If you're a woman reading this book, and chances are you are—according to statistics, many more women buy books than men—you will be delighted, and you will probably identify with many of these women. You see, we all have influence, particularly if we're women. For example, you have a great deal of influence in your home with your children. It started in the cradle and has continued to the present. In fact, I think one of the things that prompted Pat and me to write this book was a book Pat read called First Mothers. It was about the mothers of our presidents and the impact these women had on the leaders of our nation. One of my favorite stories about a woman's influence is about a woman who is not famous. Her name was Annie Johnson. In 1903, she found herself alone with two toddling sons. Her husband had left with all the money and ran away to marry another woman. Annie was six feet tall, big-boned and had no education—and she was black. Her only choice was to work as a domestic or starve. Neither option appealed to her and she had to take care of her babies. So she decided to focus on what she was good at—cooking. She wasn't a gourmet, but she could "mix groceries well enough to scare hungry away from a starving man." She set up a meat pie stand on the dirt road between the cotton gin and the lumber mill in her little town. Each day right before lunchtime, she cooked fresh meat pies, and the rich aroma brought men from the mills flocking to her little stand. She was dependable, dedicated and hardworking. She never disappointed her customers. Over the years, her little stall became a grocery store where customers could buy all kinds of goods. This woman of influence changed not only her life and the lives of her children, but also changed the economy of her town and the world of literature. Who was Annie Johnson? The great-grandmother of Maya Angelou, the author and playwright. Mrs. Johnson's perseverance, tenacity and focus have certainly impacted our modern literary world. And she started by influencing those closest to her—her children. We all affect the lives of others. The women profiled here have greatly influenced the world. They have led the way. They have left legacies that benefit all of us. Their achievements leave a blueprint that is open for anyone to follow. This is not a book of biographies, although you will get glimpses of their history. The book's main focus is centered on the achievements of twenty extraordinary women and the life lessons they learned—principles you can apply in your own life. These are women like you and me who made their lives count for something. As a consultant and executive coach, I work with many women. They all want to know how to be successful. Here's what I say: "The successful woman is the average woman—focused." The successful women in this book focused their lives on some kind of contribution to society. They were, and are, fearless, dedicated, hardworking, committed and courageous. They come from all walks of life: business, science, medicine, education, entertainment, sports and government. They had a mission and they followed through. They made a mark on the world. All of us can do the same. I am excited about this book because of the role models it provides for my own daughters. Pat and I have nineteen children. No, that wasn't a misprint. We have nineteen: fourteen adopted from various countries around the world and five birth children between us. Eight of our children are women or girls becoming women. This is a great collection of success stories, which can inspire and challenge young women to live their dreams. Eleanor Roosevelt said: "Example is the best lesson there is." That is, in a sentence, what this book is about. Enjoy!